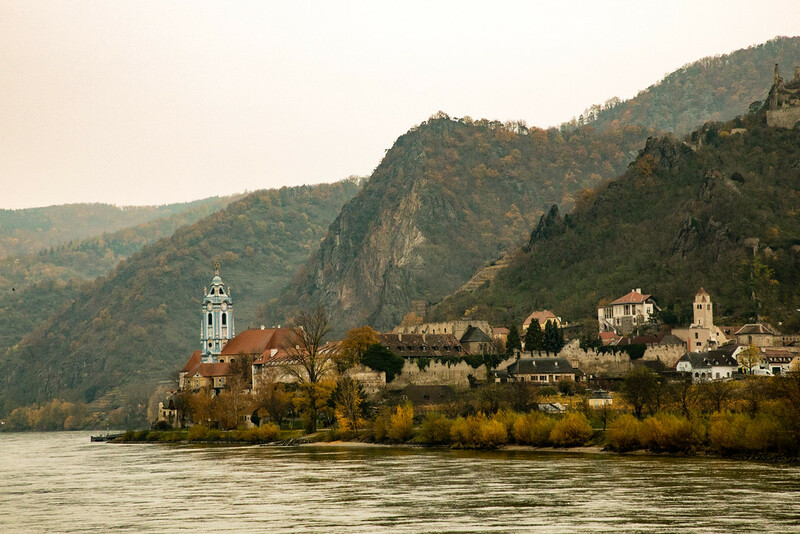 We woke up this morning to gorgeous scenery as we sailed through the UNESCO World Heritage Site of the Wachau Valley. This region is filled with charming villages, castles, churches and steeply terraced vineyards. Despite being overcast and a little chillier than the past few days, it was great just admiring the view from the sun deck before heading down to the restaurant to fill up with hot coffee and a cooked breakfast. 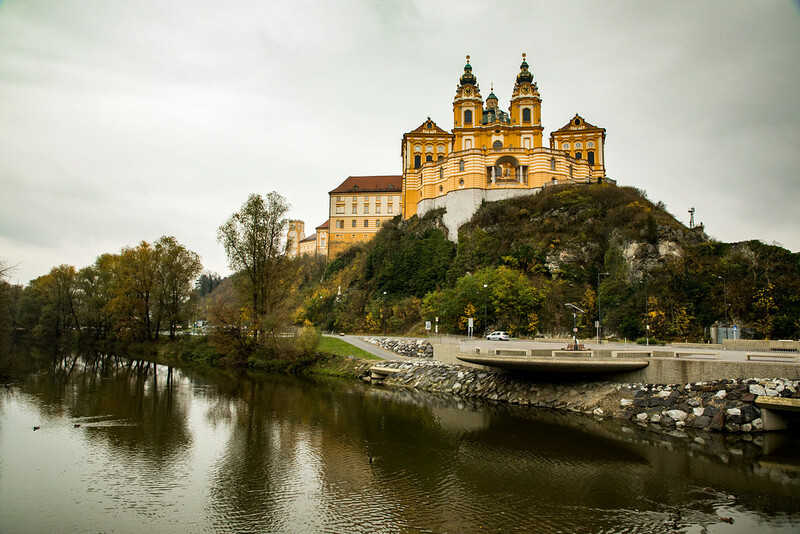 Just before noon, we pulled into the small town of Melk which is known for its vast abbey that overlooks the town. There was the option of being coached up to the abbey or a 20-minute walk. We skipped lunch as still full from breakfast and decided to walk. A pleasant stroll took us into the town, which we had a look around before climbing the steps up to the abbey. We had decided to join in one of the included tours today, so we enjoyed a coffee in the abbey cafe while waiting for the rest of our group from the ship. 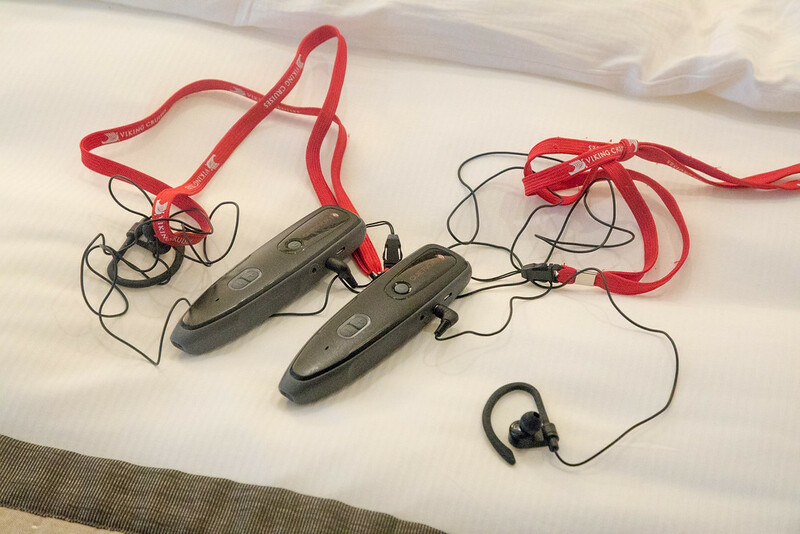 Since we had been independently touring everyplace so far, this was the first time, we would be using our QuietVox audio system. Sounds a bit fancy, eh? Now, I’ll admit I’m hopeless with technology, but even I understood how to use these. Every cabin on the boat had two receivers and two headphones, you connect with your tour guide by tapping her magic paddle, and then you can wander around but still hear everything they are saying. Cool, huh, oh I’m so easily impressed, although I hid my earpiece under my hat and QuietVox in my handbag – wouldn’t want anyone to mistake me for a tourist! The tour took us through the Abbey Museum, the Marble Hall, the Library and the Church. Unfortunately, we were not allowed to take photos inside which is a shame as the library and especially the church were stunning. But of course, postcards of the interior were for sale in the gift shop. 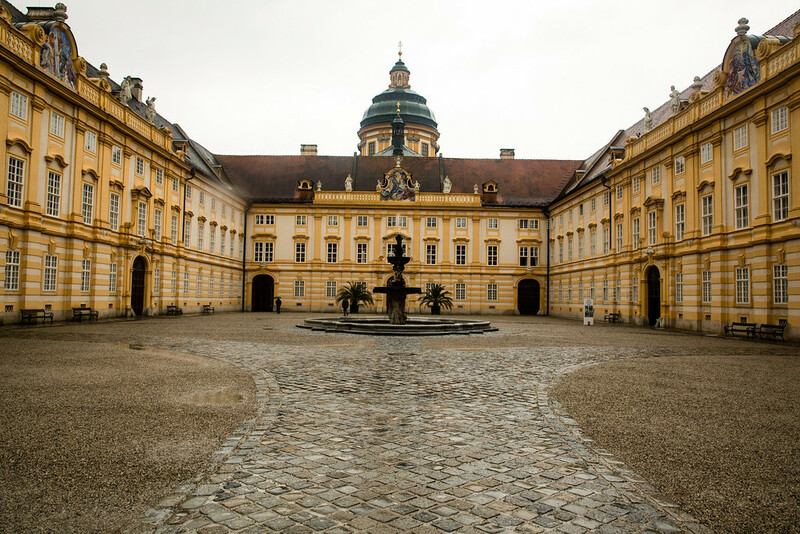 However, if you would like a peek at the inside and more information about the Abbey, have a look at http://www.stiftmelk.at/englisch/index.html. When the tour finished and because it was drizzling, we decided to return by coach where an Austrian Tea was waiting for us, complete with cucumber sandwiches and plum pastries. We then relaxed for a while before heading to the bar for pre-dinner cocktails and listened to the evening Port Talk about tomorrow’s options. Then off down to the restaurant for more food and red wine. After dinner, we joined in the Movie Quotes Quiz; our team did quite well but alas, not well enough to win the champagne.